Heather Connolly, coloratura soprano, is internationally recognized for her work in opera, concert and recital. 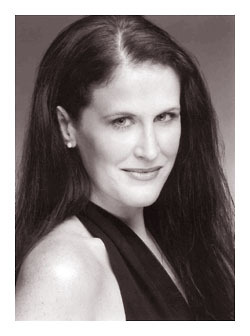 The winner of a scholarship award from the Sergio Franchi Foundation, a finalist in the Florida Grand Opera Voice Competition and the recipient of the Young Singers Development Award from the Century Center Theater in New York City, Ms. Connolly has captured audiences throughout the world with her performances as the Queen of the Night in Mozart's "Die Zauberflöte", the title role in Donizetti's "Lucia di Lammermoor", Zerbinetta in Strauss' "Ariadne auf Naxos", Madame Herz in Mozart's comic opera "Der Schauspieldirektor", Olympia in Offenbach's "Les contes d'Hoffmann" and Cunegunde in Bernstein's "Candide". Ms. Connolly has appeared in concert in Russia with the St. Petersburg State Symphony Orchestra conducted by Maestro Alexander Kantorov at the Great Philharmonic Hall in St. Petersburg, where her programs included the rarely performed "Concerto for Coloratura Soprano and Orchestra" by Reinhold Glière. She was also featured in concert at the famous Villa Faraggiana in Albissola Marina, Italy with the Orchestra Sinfonica di Sanremo under the direction of Maestro Pietro Veneri. Ms. Connolly's concert appearances have taken her throughout America, Europe and Africa, where Ms. Connolly was honored to be invited to give a private performance at the Palais Royale for His Royal Majesty King Hassan II of Morocco. Ms. Connolly is a graduate of The Renata Scotto Opera Academy in Savona, Italy, and trained in private lessons with Luciano Pavarotti. Experience Ms. Connolly live in concert with the St. Petersburg Symphony Orchestra.